Ball transfers in table for 6500 Series (optional for 6375 Series). 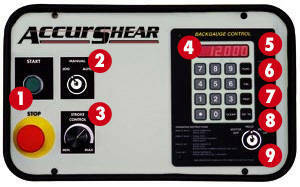 The backgauge control features a keypad display, LED readout, and ninety-nine pre-select programmable positions. Under normal use, the operator keys in the desired backgauge setting, presses the “Go To” key, and the backstop bar moves to position. 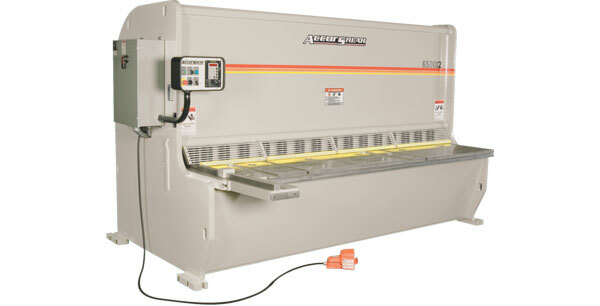 The Accurshear may also be programmed for single-step, or sequential shearing. To accommodate high accuracy, the backstop bar actually moves slightly beyond the desired position and then comes forward to eliminate any clearance between the lead screws and nuts. The shear operator may also choose the backgauge retract feature via the key switch. This retracts the stop bar once the holddowns clamp the material just prior to the shear cycle to avoid material wedging between the shear knives and stop bar.